Today was Day #4 of Chocolate and Gluten Free Cookie Theme Week. European style macarons have become a very popular choice for those in the San Francisco Bay Area with a sweet tooth who can't have wheat/gluten. Karin Johnson (and her mother) were offering at least three different gluten free cookies at the Palo Alto Farmer's Market this morning, and I tried two: 1.) 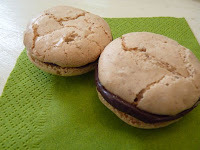 a light meringue sandwich-style macaron with a chocolate filling, and 2.) an almond macaroon, flavored with cardamom and topped with a whole, blanched almond. These are sweet cookies by nature, but I enjoyed trying both of these. The cardamom was a nice addition to the latter, but not everyone I shared these cookies with could taste the cardamom, so I may have gotten lucky and had a heavier distribution of the spice in my cookie. It's always nice to have more fresh gluten free cookie choices, especially in one's own backyard farmer's market. Karin Johnson Specialty Cakes and Pastries does not appear to have their own website at this time, but this family-run business does participate in other farmers markets in the San Francisco Bay Area. Note: According to Wikipedia, Macaron stem from the Italian word "maccarone" which apparently means "paste." Macaron and macaroon are sometimes used interchangeably, which can be confusing. 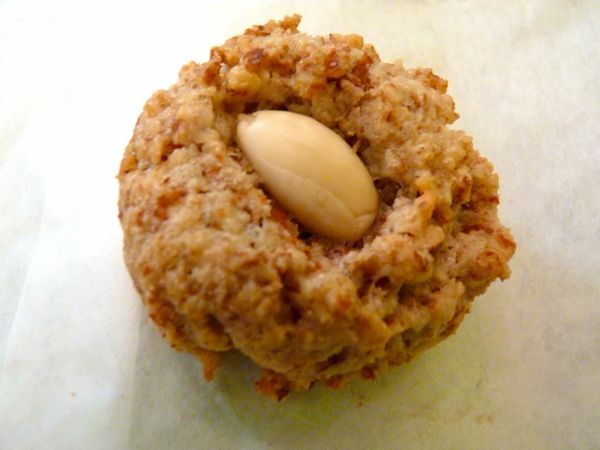 Many envision a macaroon as being a sweet cookie made from shredded coconut. Both styles of cookie lack a gluten-based flour base batter, so their initial consistency may be more paste-like.